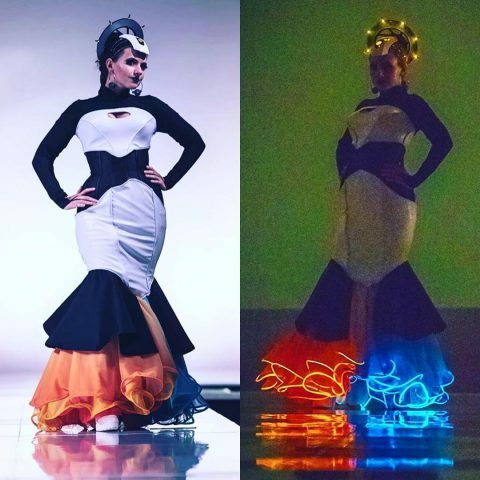 Her Universe Fashion Show Shines Light on Geek Couture « Adafruit Industries – Makers, hackers, artists, designers and engineers! Her Universe has been hosting a fashion show at San Diego Comic-Con since 2014. The event offers designers the opportunity to make chic, couture designs inspired by their favorite fandoms. This year the fashion show included ensembles — mostly dresses — based on Star Wars, Marvel, Studio Ghibli, and more. The winning designs were Doctor Strange and Princess Mononoke outfits. You can see those looks and more during the final runway walk in the above video by The Wookiee Gunner. Designer toughtink, a.k.a. Kelsey, came up with a look inspired by Portal and the headpiece and dress featured glowing, LED elements.